* Known as marak temani to everyone else. Adapted from the 196 Flavors blog. This month, I’m back with the second installment of Stranger Than Fiction 2019—my annual review of what’s happening in the news and how closely it tracks scenarios I’ve predicted in my novels. If you missed Part 1, check it out and see how recent Russian actions feel eerily similar to the plot of my latest book, Red War. When I wrote last year’s Enemy of the State, I decided to tap into Vince’s longtime disdain for Saudi Arabia. If you’ve read the entire Rapp series, you know that the kingdom’s bad behavior is a recurring theme. The general premise of the book was that high-level members of the Saudi government were involved in 9/11 and that the American government swept it under the rug to keep the oil flowing. Right after publication, allegations surfaced that Saudi Arabia’s US Embassy had funded a dry run for the 9/11 attacks. The novel’s antagonist also seems to have gained a real-world counterpart. In the story, the head of Saudi Intelligence intends to lead a coup, eliminate his enemies, and consolidate his power. Shortly before publication, Mohammed bin Salman rose to power in Saudi Arabia and took a few pages out of my character’s playbook. He began restricting the influence of religious leaders, imprisoning his rivals, and killing his critics. On a less gloomy note, after the release of Enemy of the State, I came across this stealthy motorcycle created by DARPA. Mitch rode something similar to sneak up on ISIS leadership. DARPA says that the bike is about as quiet as an indoor conversation. One of the most sinister things I’ve read this past year is the way China has begun tracking its people and grading their value as citizens. The government isn’t just looking at obvious crimes like tax evasion, but also infractions as innocuous as smoking in nonsmoking areas. Someone who is deemed undesirable can be restricted from things like buying plane tickets, taking out bank loans, and getting government jobs. This social scoring system looks incredibly similar to one I devised for my 2013 book The Utopia Experiment. My version was an augmented reality system that captured data about people and used it to score their value as human beings. What do they do for a living? Do they have a good credit rating? Give to charity? Have a criminal record? And since I write thrillers, of course all that data got into the wrong hands. One of my favorite books to write was Darkness Falls, a story about the end of the world’s oil supply and the devastating effect of that loss. I did a lot of research on potential biological threats to the oil supply as well as what it would mean to lose such a critical commodity. Oil isn’t just power. It’s plastic. It’s lubrication for machinery. It’s pharmaceuticals. The list goes on and on. Earlier this year, I came across the accidental discovery of an enzyme that eats plastic bottles. It felt like something from my book and reminded me how fascinating science can be. It’s a question that never stops bouncing around in my head. I look forward to the end of 2019 to see what I got right and, sometimes just as interesting, what I got wrong. It’s a new year and that means I’ve been at my desk poring over 2018’s events to see how well I did at anticipating—and maybe even predicting—the things playing out in the news. The past year didn’t disappoint as technology moved forward and some shady world leaders returned to their old tricks. As always, there were days that the newspapers felt like the ultimate thriller novel. I grew up on Cold War thrillers and with Russia reemerging on the world stage, it was time for Mitch Rapp to turn his attention toward America’s age-old nemesis. I stuck pretty close to reality when creating a scenario for the book. The Russian people admire strong leaders and Vladimir Putin is a prodigy at projecting that strength. With an economy similar to that of Texas, he consistently succeeds at staring down the world’s superpowers. And every time we blink, he gets a boost at home and knows he can push a little further. In my scenario, he attacks NATO at the poorly defended borders of the Baltic States. How close was my story to what’s happening today? Most people don’t know it, but Russia has an enclave on the Baltic Sea between Poland and Lithuania. It would be critical to an invasion of the Baltic States as it’s on the southern border. This past summer, aerial images suggested that Russia was modernizing a nuclear weapons bunker there. By fall, a commercial satellite firm confirmed that there was work happening in four areas. Shortly after the release of Red War, Russia started flexing its muscle again with Ukraine, blocking shipping lanes and seizing ships. A similar tactic was used in my book by the Russian president to prop up his support at home and to divert the West’s attention when he moved on the Baltics. Fortunately for the world, the second part of my prediction didn’t materialize. It’s really impressive that Russia continues to convince everyone that they have a world-class military. Their budget is less than that of Saudi Arabia’s and about one tenth of what the US spends. In Red War, Mitch Rapp comments on this disconnect, mentioning the sad state of Russia’s Navy. A little over a month after the book was released, an icebreaker the Russians have been trying to get out to sea since 2012 burst into flames. And that comes on the heels of their biggest dry dock sinking while they were working on their only aircraft carrier. Someone needs to slap down on Russia hard. Unfortunately, Mitch seems to be the only guy with the guts to put them in their place. Many years ago, I tried to convince Tom Clancy to write a book about a high-tech war between Japan and China. Unfortunately, he didn’t want to do it and I felt like it was too far outside my wheelhouse, so I put the idea on the back burner. By 2015, I’d finally thought about it long enough and put pen to paper, envisioning a highly advanced Japanese military industrial complex lurking just out of sight. In Patriot Attack, the Japanese were using their technological gifts to create a clandestine war machine built on the principles of fast, cheap, autonomous, and deadly. Now, with friction in Asia escalating and China making increasingly aggressive moves in the region, I’m thinking about that book again. In mid-2018, news broke about the activities of an ultra-secret spy agency that reports to the highest levels of Japan’s government. It turns out that my idea of a completely black weapons development directorate isn’t so far-fetched. In my scenario, the Japanese also create a bioweapon and secretly immunize their population against it. The idea was that any invading army would be severely sickened while Japan’s citizens would remain healthy and able to fight. In late 2017, a defecting North Korean soldier was found to have antibodies against anthrax. Have the Kims weaponized anthrax and vaccinated their soldiers in a plan similar to the one I wrote about years before? 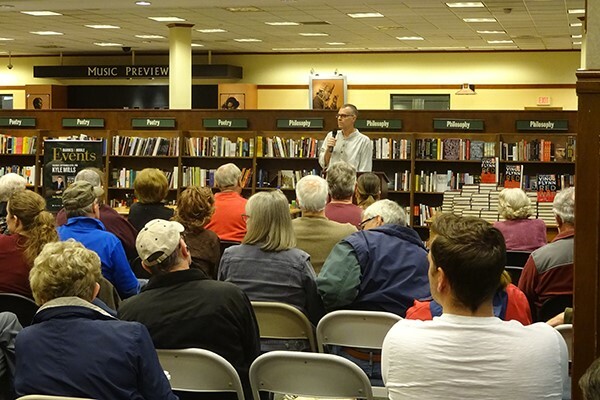 In case you missed the videos, interviews, and reviews from my Red War tour, here are a few recaps to catch you up on what people wanted to know while I was on the road promoting my latest book. It was clear to me as I traveled around the country that Mitch Rapp is hotter than ever. He continues to fascinate readers with his no-nonsense approach to solving the world's problems. The Poisoned Pen is an iconic mystery/thriller bookstore in Arizona. There, I was interviewed by fellow thriller writer and former Navy SEAL, Jack Carr. It was the first time I’d met Jack face-to-face, despite having a mutual friend in Brad Thor. Afterward, we went to dinner where I was able to annoy him with questions about the psychology of Navy SEALs. Ryan Steck, who many know as the Rappologist, is the most knowledgeable guy on the planet when it comes to Mitch Rapp. He's the man I call on when I’m stumped about a bit of series esoterica. Here we do a deep dive into the book, the series, and Vince’s continuing influence. He reviewed Red War, too. “We have been, historically, very afraid of provoking Russia, and Russia seems to have no similar problem with provoking us… We should have a heavy military presence in the Baltics but we’ve never wanted to do that because Putin would consider it a provocation. I say ‘bring it on'.” This is one of the more interesting interviews I had during the tour because we took a detailed look at Russia, Putin, and the potential mistakes America is making in handling him. The interview begins at the 40:00 mark. Stepping Into The Shoes Of An Icon Part II: Who Is Mitch Rapp? Mitch is a rich, beautifully drawn character, with all the complexities that entails. Like all of us, he’s not one static personality. He’s evolved over his life, reacting to his changing environment and absorbing new experiences. Vince took Mitch from the angry college kid we saw in American Assassin to the seasoned operator of The Last Man—with a lot of stops along the way. When I wrote my first Rapp book, The Survivor, a number of fans thought I’d turned Mitch into a thug. In truth, though, I was just continuing Vince’s depiction of where the character was at that point in his life. Starting with Pursuit of Honor, Mitch begins to feel more angry and frustrated than in the past. He assaults Mike Nash for disagreeing with him, cripples bar bouncers, and entertains the idea of working for a Russian mobster. In The Last Man, the first 100 pages are filled with Rapp arm-twisting friend and foe alike. I think the reason for this is twofold. First, the death of his wife and unborn child was a blow he never fully recovered from. And second is the fact that as 9-11 fades in the minds of many Americans, he sees our vigilance waning. With my second book, Order to Kill, I made a conscious effort to pull Mitch back from the brink. He starts thinking about getting his life together and even entertains the idea of having another relationship. Enemy of the State and the upcoming Red War continue that gradual realignment with the goal of taking him back to what he was in earlier books. Of course, at his core, Mitch will remain the same: A patriot. A man with laser-like focus who doesn’t suffer fools. A loyal comrade in arms. But most of all, a soldier with the skill and courage to protect the country he loves. I get a lot of questions on the subject of how I went about taking over the Mitch Rapp series. Now, with a few books under my belt, I thought it would be fun to do a few posts about it. You’ve probably already guessed that the first order of business was research. I reread all 6,512 pages of the Rapp books and took almost 150 pages of notes. Every weapon Mitch had ever used. Mike Nash’s kids’ names. Even Vince’s word choice and how he liked to construct action sequences were deconstructed and agonized over. It was only when I could stop analyzing the books and start feeling them that I put pen to paper. Fortunately, Vince’s last novel, The Survivor, left a lot of clues as to where he wanted the series to go. That made the follow-up to The Last Man a perfect book for me to start with. As the series has continued, though, I find myself focusing more and more on Vince’s overall philosophy and how he would have applied it to an ever-changing world. 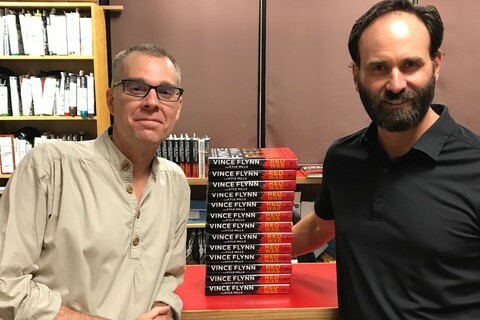 Last month, I outlined some interesting predictions I’ve made over the years and also explored some that Vince Flynn has woven into the Mitch Rapp series. The list was longer than I expected. This month I’m back with a few more examples of how we’ve used a crystal ball to peer into the future. Once again, I’ve called on Ryan Steck, the Rappologist from The Real Book Spy to share examples of some of Vince’s all-too-real plotlines. Longtime fans of the Rapp series know how solid Vince’s intel was. Vince’s brother, Tim Flynn, joked at The Survivor 2015 launch event that Vince was a master at getting people to open up. He said that within a few minutes of sitting down with Vince, SEAL Team 6 was sharing details they weren’t supposed to talk about. He also mentioned the similarities between the bin Laden raid and Memorial Day, which I talked about in Part 1. In 2007’s Protect and Defend, Vince wrote about the Israelis taking out an Iranian nuclear facility by embedding an agent and blowing up the plant from the inside. In 2013, a nuclear facility buried deep in an Iranian mountain was allegedly partially destroyed by a massive explosion, leaving 240 people underground. While both the Iranians and Israelis are tight lipped about what really happened there, the information available makes it sound very much like Vince’s scenario coming to life. Here are a few other strangely prescient scenarios that have played out in reality long after my books were published. I’m fascinated by wearable technology. Not so much the kind that spits out data about my workout, but the kind that will transform our senses and help us deal with our increasingly complex world. In The Utopia Experiment, I dreamed up a device that was embedded into a person’s skull much like a cochlear implant. It fed information to the user via an augmented reality overlay that mixed the real world with holographic details. The device provided a flood of information: from emails, social media updates, and heads-up displays, to real-time fact checking and driving routes. Facial recognition even delivered instantaneous information about people and their backgrounds. Obviously, the military applications were endless, as were more sinister ones. As I was finishing the manuscript, the Google Glass project was announced, leaving me scrambling to find out if I’d been just a few months behind the curve. Fortunately for me (but not so much humanity) their technology was only a primitive first step toward my vision and fizzled pretty quickly. Now more sophisticated wearable augmented reality in the vein of what I imagined, such as Microsoft’s HoloLens and Meta’s headset, are taking shape, not to mention the virtual reality devices like Oculus Rift that create an entirely new universe for users. Real-time fact checking didn’t exist when my book was first conceived, but now organizations like PolitiFact do their best to keep politicians honest during their speeches. Imagining this futuristic technology was challenging so I’m interested to see how it evolves. So far, I’ve gotten a surprising number of things right. Like most people, I appreciate a good heist—particularly when some incredibly clever criminal has thought long and hard about it. I decided to explore just such a scenario in The Second Horseman after having a fascinating conversation with a Vegas insider about how the city transports all that casino money to the Federal Reserve in San Francisco. I recently read that thieves in the Netherlands stole a truckload of iPhones while the truck’s driver cruised down a motorway with no clue what was happening. Apparently this style of iPhone theft has been happening since 2008 in Europe. I dearly hope that my description of a similar technique in 2006 provided some inspiration. I’ve already started my list for 2019 as I see some nefarious players making trouble that I envisioned long ago. It’s possible that the course of the world has already been laid out by today’s hardworking thriller writers. Stay tuned! Kyle Mills Talks About Writing Rapp, Enemy of the State and More! We have a round-up of Kyle's favorite 2017 interviews to catch you up on all things Mitch Rapp. Kyle touches on a wide range of topics from what it's like to inhabit Rapp and continue his story for millions of fans to where Mitch, Scott, Irene and the rest of the team are heading. If you haven’t discovered Ryan Steck’s thriller website, you’re missing out. Ryan’s encyclopedic knowledge of the genre gives readers all the intel they need to stay current on the hottest titles. Here’s my latest interview with him and his review of Enemy of the State. The Big Thrill is the magazine produced by International Thriller Writers, and their monthly emails are a fantastic place to discover new titles and authors. Here’s my interview with Alison McMahan. Here’s the conversation I had with longtime Vince Flynn fans Angela Halgrimson and Stacy Verdick Case on this Minnesota podcast’s 1-year anniversary. No introduction needed here, Glenn’s a legend in the radio world. "Mitch Rapp is one of the best characters in fiction now,” he says. We talk about this and much more. I spent some time with John J. Miller on the Ricochet podcast as he dove into Mitch Rapp and the American Assassin movie. Elise published her Enemy of the State review and her interview with me in a variety of places. Here are two of them: Crimespree Magazine and the Strand Magazine. I really enjoyed my interview with writer and host, Hank Garner. Hank can introduce you to both traditionally published and indie authors who write in a wide variety of styles. Scroll down to the August 30 podcast, Chapter 30. We talk about what it was like to take over for Vince Flynn. A business podcast is not my usual venue but I’m so glad I got an opportunity to talk to Jess Larsen. He’s interviewed an impressive group of people—both from the business and creative world—and I’m happy to be one of them. Scroll down for Parts 1 and 2. Check out this fun site run by Gayle Lynds, Karna Bodman, Jamie Freveletti, and several other successful thriller writers. In my guest post, I talk about recreating another author’s characters. In our latest audio clip, New York Times #1 bestselling author Brad Thor discusses his relationship with Vince and Kyle. Stay tuned for updates, including the title, cover art, free preview, giveaways and publication date. Mitch Rapp returns in the #1 New York Times bestselling series in this timely thriller as a Saudi prince is discovered using his fortunes to fund ISIS, re-opening secrets about the Saudi government’s involvement in 9/11—secrets which the United States tried to bury. In the latest novel, Mitch Rapp is given a dangerous mission by the President himself: find out which high-level Saudis are involved in funneling money to ISIS and kill them. The catch? Rapp will get no support from the United States in this endeavor. Rapp therefore makes a decision that will change his life forever—he quits the CIA to avoid involving his men in something this illegal and decides to assemble a group of independent assassins to complete the mission. What they discover is a tangled web of allegiances leading back to the head of Saudi intelligence. But in the search for truth and justice, Rapp himself is discovered. Soon the Saudis and Americans are forming a joint task force to stop him, supported by the President, who denies his involvement, just as he warned he would if Rapp’s actions became known. Will this mission prove to be Rapp’s final one?